Super Boswellia 100 mg | Relief for Painful Joints | Get Here! This new titrated extract of the plant Boswellia serrata significantly increases the already substantial anti-inflammatory effects offered by our previous product. A much lower dose can now be taken with potentially greater effect. Boswellia serrata is a medium-sized tree with large branches, native to India. Its resin is highly valued in Ayurveda – the extract is used in this traditional Indian system of medicine as a powerful and natural anti-inflammatory. It wasn’t until the 20th century, however, that it began attracting the interest of doctors and therapists, and it is now available to buy in dietary supplement form. As well as being a natural anti-inflammatory, it has the advantage of causing no gastrointestinal side-effects, thus protecting the gastric mucosa from ulcers. ¤ Standardised extract of Boswellia serrata is mainly used for its anti-inflammatory and pain-relieving properties, which make it especially effective for treating decreased joint mobility and flexibility. Contrary to most medicines of this type, boswellia serrata, even when used over long periods, does not cause any digestion-related side-effects, thus protecting the gastric mucosa from ulcers. - it increases mobility by preventing leukotriene synthesis by the enzyme 5-lipoxygenase (5-LOX). ¤ Leucotrienes are actually involved in many inflammatory diseases. They cause inflammation by accelerating oxidative damage, calcium translocation and auto-immune reactions. The new boswellia extract AprèsFlex™ is standardised in AKBA (3-0-Acetyl-11-Keto-beta-Boswellic Acid), the most important boswellic acid for joint health and inflammatory problems. ¤ AKBA is a powerful, natural inhibitor of pain mediators, including 5-LOX and the protein that activates 5-LOX, as well as of TNF-alpha, as demonstrated by several blood markers. In addition, it destroys the activity of certain matrix metalloproteinases, in particular that of MMP-3, thus protecting cartilage from breakdown of collagen, an important component in connective tissue. ¤ A great many clinical improvements have been reported with this proprietary extract, which was developed in a centre for research into plant extracts in India, and is recognised by the country’s Ministry for Scientific Research. Most of the clinical studies have reported: optimal absorption, rapid action, excellent tolerance, and notable and long-lasting improvements in joint mobility, as blood levels demonstrate. ¤ In one study of 175 patients confined to bed, 67% reported improvements - rated either good or excellent - in various parameters: morning stiffness, pain, and ability to carry out daily activities. These improvements were felt fairly quickly – on average, after just two to four weeks of treatment. ¤ Even better results are reported when boswellia is combined with extracts of ashwagandha and curcuma which also act on the inflammatory parameters that cause pain (see these products in the Ayurveda section). ¤ Other studies have shown boswellia to be effective in patients suffering from bronchial asthma, with improvements noted in 70% of cases, both in symptoms and in biochemical parameters, as well as in the treatment of chronic inflammation of intestinal mucosa (IBS, Crohn’s disease). ¤ It should be noted that non-standardised boswellia extracts are poorly distributed in the bloodstream ; hence the interest in the new standardised extract AprèsFlex™ which is up to 52% better absorbed than other extracts available to date. 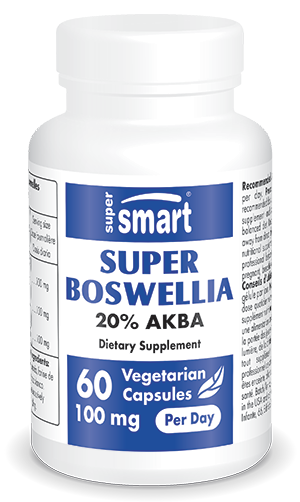 With straightforward dosage of one capsule per 24 hours (as opposed to the previous six), excellent bioavailability and a wider spectrum of activity, this new extract standardised to 20% AKBA Super Boswellia AprèsFlex™ is an essential choice for pain relief.